I know it hasn’t been long since I last did a homeware wish-list but procrastinating before my exams has led me back to this point, so I thought I’d at least be slightly productive and blog about the items I’ve found. I’ve exclusively used etsy.com this time around and found some beautiful little pieces that would look amazing in anyone’s home. I’ve been loving prints recently and I found quite a few which I’d love to have in my house. The first one is this beautiful gold framed print: “When I’m with you all is right in the world” which I honestly think is a beautiful and inspiring print. I’d even go as far as to say that that’s how I feel as far as my boyfriend is concerned (except when he leaves the toilet seat up. That’s not okay.) You can purchase this print here. The second print is one that’s more me than anything else, as obviously my blog name is Hollie in Wanderlust. I absolutely love travel and have been fortunate enough to do a LOT of it in my 22 years of life and while I’m busy studying and living here in the UK I have that tingle in my extremities just teasing me to get back on the road and do some more exploring. This print is purchasable here. My third choice is this absolutely beautiful wooden cut out tea light holder. Paul bought me quite a few candles and candle holders for Christmas which I decided to save for our new house so I’ll probably get into trouble for wanting another one, but this is definitely allowed… I just think it would look lovely with the other tea light holders that he chose for me (they’re both wooden as well) and add a bit of fanciness to the room where the light shines through the cut out trees. You can pick this one up from here. 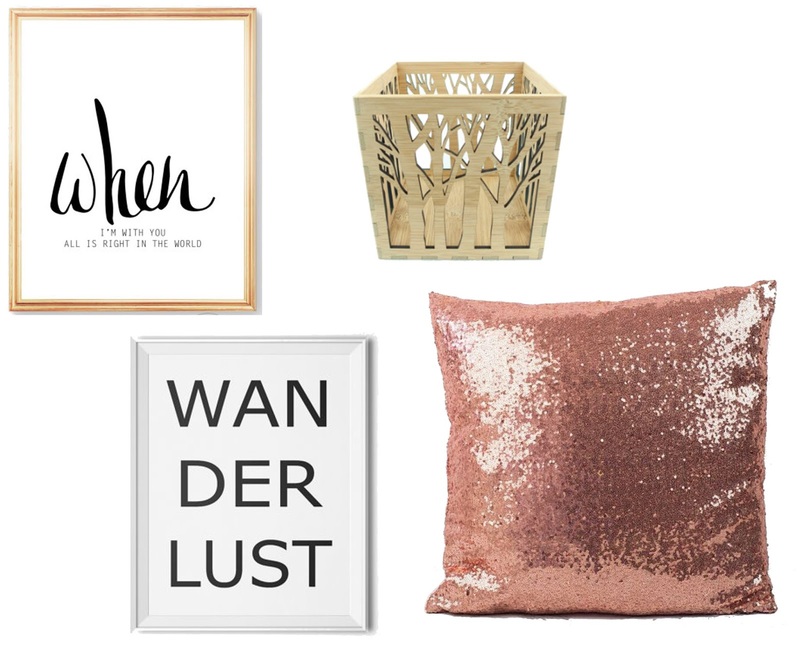 The last thing I’ve got on my little homeware wish-list is this absolutely gorgeous gold-rose coloured sequinned cushion I think it’s absolutely gorgeous and totally me, so I’m hoping to get a couple of these thrown on my couch within due time! Pick them up here. What’s on your homeware wish-list at the moment? Let me know! Next Post Food: Lunya, Liverpool.